Discussion in 'Stock 2002 - 2005 Explorers' started by aaronworking4u, September 24, 2015. I have a 02 Ford Explorer with 4WD. I removed the front drive shaft that comes from the transfer case going to the front diff. It has 6 loose ball bearings and I can't get it to go back in for the life of me. I have tried many different ways and still have not been able to get it in. Can someone please help me and tell me how to get the drive shaft to go in the socket with the bearings? Please. I have spent hours and now days trying to figure it out and have not been successful. I greatly appreciate it. Thanks. If anyone has any questions they will like to ask to get a clearer understanding or picture of the problem I'm having, feel free to ask. No need to triple post. It sometimes takes a while before a person with the knowledge you need to see your post. Also, welcome to the forum. This was posted in the wrong section and should be here: http://www.explorerforum.com/forums/forumdisplay.php?f=101 Hopefully a mod can move it. I know what you mean about this being a PITA, but it takes a sec to figure it out. The front of the driveshaft should go to the left of the front differential and then you should be able to go far enough forward that you can lift the back up and then place it in. Sorry for the triple post it was my first time posting and I kept getting a can not display page. so I didn't know if it had posted or not until I looked and saw it posted three times. Thanks MayJan for the link. but the drive shaft I'm trying to put in is the one that goes from the transfer case to the front differential for the 4 wheel drive. I looked on youtube and a guy had the same problem with drive shaft but didn't have video to show how to put in the 6 loose ball bearings on the shaft that connects to the transfer case. I'm have a problem with my 02 Explorer 4.6 4WD front drive shaft that comes from the transfer case. The front of the drive shaft is fine cause it has a normal U-joint. That side is simple. The trouble that I'm having is the back part of the drive shaft that has a bearing with 6 loose ball bearings, big ones, not regular size. I looked up for the 96-99 the bearing comes in one piece with a retaining clip. that looks simple too. But the problems with this one is that there is grooves for the bearings but they are not straight. the grooves on the transfer case and the drive shaft turn slightly. So I'm not sure how to get in. I tried putting the bearing on the shaft first then sliding it, but it won't slide in cause the bearing when put on the shaft is too wide to fit in the transfer case. Then I put the bearing in the transfer case first and tried pushing in the shaft but now the bearings aren't letting the shaft to go in. This has been a nightmare. Can someone please Help? Thank you so much! Just to be clear, you can get the driveshaft in place, you are just having trouble installing the 6 bolts? Aaron, I deleted your first two duplicate threads, and I moved this one into the 02-05 section. Then, I saw you already posted here with more and clearer info, so I merged that post ino this thread. It reads a little funny because it merged posts chronologically, but it's the best I could do. I also slightly reworded your thread title, to make it clear you want help. Hope you get the info you need. I think you are talking about a cv joint? I have a 2 wd so I don't know what the front shaft looks like. But if you have ball bearings then a picture might help. But it sounds like the cv joint is apart. Limited 02 The problem that I am having is not the 6 bolts. it's getting the ball bearing to go in to the correct position. the drive shaft looks like the one in the picture from the 05 ford escape. Thank you for the picture rwt101. the drive shaft that I'm trying to put in is just like the one you put up. the shaft on the left side with the ball bearings in that picture. With the drive shaft having those grooves I can't get the bearings to line up. I don't know if there is a special way to install it. 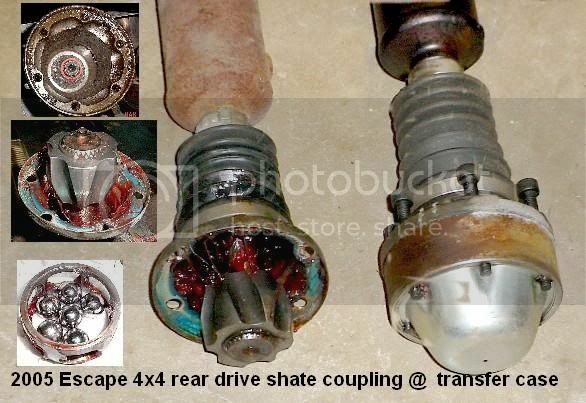 Is it bearings on the drive shaft first then put it in the transfer case? I tried doing that and it didn't go in because the bearings stick out too much that it doesn't allow the shaft to go in. It's very complicated. and I don't know how to post pictures on here so I can show you guys. If somebody knows please help direct me on what the steps are. Thank you so much everyone.